Coruscant is the center of the Star Wars galaxy. While its upper echelons are a hub of political activity, the underworld serves as a much more dangerous locale. In the dark underbelly of the city, you always have to watch your back, never knowing when a confrontation might turn into an unexpected skirmish. 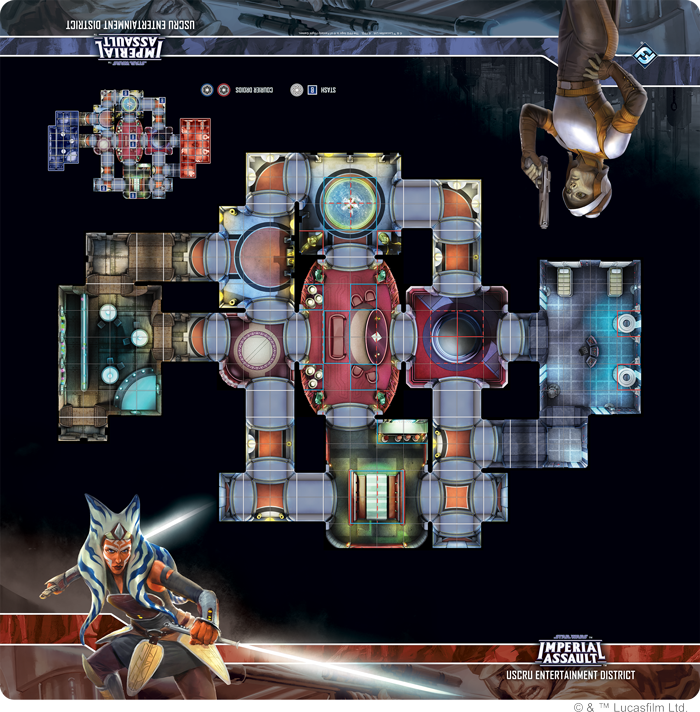 Fantasy Flight Games is proud to announce the Uscru Entertainment District Skirmish Map for Imperial Assault, available for order now from your local retailer. This 3' by 3' slip-resistant map takes your Imperial Assault skirmishes to the notorious Coruscant underworld. With this mat, setup for your skirmishes takes only the few seconds that you need to unroll the mat, while providing an environment packed with obstacles and tight corridors. The Uscru Entertainment District is infamous for its clubs and bars, as well as being the perfect place for a fugitive to disappear into the massive crowds of the underworld. Of course, this doesn't make you invisible and this Entertainment District can just as easily turn into a battlefield. Make sure you aren't taken by surprise with the Uscru Entertainment District Skirmish Map! Take your Imperial Assault skirmishes to the next level with the Uscru Entertainment District Skirmish Map (SWI53), available for order now from your local retailer!